Firebloom is a rare herb that is used to make a few novelty items and even some important alchemy items like the Philosopher Stone. For this reason you may see it selling on your realm and it might just be the herb to farm. It will sell best in stacks of 1, 5 and 10 but if you’re the only one selling it you should probably post it in stacks of 10 or 20 so that people who only need a few have to buy a bunch of extra. It usually sells anywhere from 1 to 4 gold per herb, mostly at the lower range though. If a player needs Firebloom they’re going to pay you for it. You will need to have level 205 Herbalism before you can pick this stuff up. You’ll want to be at least level 50 before you try to farm Firebloom. Update: You can make a lot of gold with Firebloom, but if you want to step it up and make thousands of gold you should read my personal favorite guide. 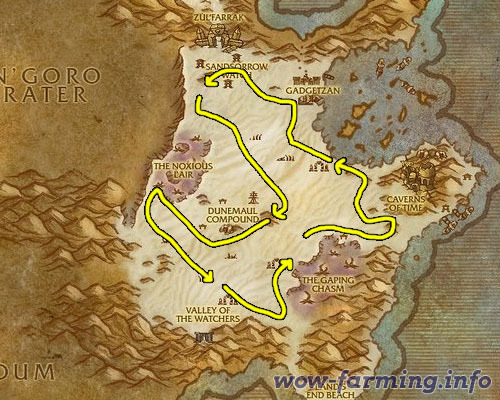 The second best place to farm Firebloom in is Tanaris. 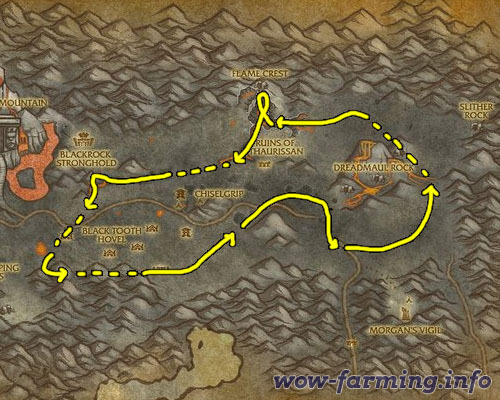 There is Firebloom scattered around different areas of the map, follow this route to find the most of it. Make sure you’re level 45 or so before trying to farm this stuff.